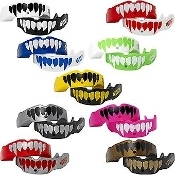 Battle Fangs Football Mouthguard 2-Pack is an advanced mouth protection system that rivals the safety and performance of custom-molded mouthguards, but at a fraction of the cost. Made of our patent-pending Ever-Mold Composite, Battle Mouthguards are designed to be re-boiled and remolded multiple times for the ultimate fit. Every Battle 2-Pack Fang Mouthguard comes with a $35,000 dental warranty.